It was exactly as she described it. Gnarled oak roots curled and clawed their way to the surface cracking the sidewalk in a seeming effort to trip up, even block, any and all visitors. The somber lavender-gray walls rose as sharp and straight as a blade out of damp dirt that surely only two centuries ago must have been marsh land. Four white columns striped the front, but instead of reminding me of the Greek temple from which the architect borrowed, they reminded me more of trapping, sapping prison bars. And the black wrought iron fence, both surrounding the yard and crossing the balconies, looked as clotted as a spider web heavy with flies and gnawing gnats. The flagstone, uneven, dark, might as well have been winding me into the very mouth of hell as leading me up to and around this house. While unexpectedly clean, the pool looked less inviting for a cool, refreshing dip and more like it was the river Styx itself-I would not have been surprised to see Charon rowing across it-or perhaps it looked more like it was the pool featured in the opening scene of Sunset Boulevard-I would neither have been surprised to find a dead body floating in it, face down. 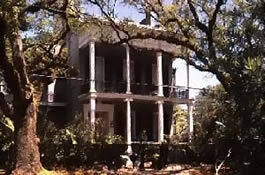 As Sue Tebbe, executive assistant to bestselling Anne Rice, lead me around the grounds of the novelist's mansion, the same mansion featured in The Witching Hour, I had an epiphany, twofold. While critics often praise Toni Morrison for the concrete, immediate, and well-developed sense of place in her novels, they could just as well praise Anne Rice for this same skill. As we wander through the pages of The Witching Hour, we likewise wander through the Garden District of downtown New Orleans. She deftly creates the gloomy grandeur of the same fading families that floated across the pages of such great twentieth century writers as Tennessee Williams and William Faulkner. As I stood in front of the house on First Street, the house that she had described so accurately in her novel, I could have sworn I saw Deirdre Mayfair herself sitting on the porch with a man in a brown suit with brown eyes and brown hair leaning over to kiss her on the cheek. I also realized that Rice's own environment does much to inspire her dark imagination. The nearly daily rain, the suffocating humidity, the swarming mosquitoes, the peeling, old mansions-witnesses to so many dead, the wicked Spanish moss. Even the old orphanage, St. Elizabeth's, Rice purchased but a few blocks away, reeks of tragic, parent-less circumstance, of strict nuns rapping knuckles with rulers, of cold Dickensian porridge. Anne Rice vividly portrays place in her novels, but the place within which she lives eases that task as it is as dark, as rich, as nefarious as anything she might wish to describe. After walking around her house on First Street, I can agree that it indeed looks, as she describes it in her novel, like "a breeding place of evil."